About a month ago, we brought home this cutie. Of course, now she looks much different in her Jacey approved puppy cut and snazzy sweaters. She was technically Jacey’s 10th birthday present, although she has already stolen a spot in all of our hearts. I can hear everyone who truly knows me asking that question. Jacey had been BEGGING for a dog for over 5 years now. She had done all the research on the best breed for our family due to allergies and the fact that I am a neat freak. She was also taking into consideration the fact that our backyard is small. I kept saying no. Too much responsibility, too expensive. I didn’t think she was old enough to take care of it, etc, etc. But behind that “no” was also an immense amount of guilt. She is an only child and will always be an only child. An only child with a Dad in the military and a Mom with cancer. I wanted her to have “someone” there for her on bad days and good days. Someone besides Bryan and I to make memories with. Someone to cuddle with when we can’t. About 4 months ago I started looking at the local shelters every couple of weeks. I kept my “no” face on for Jacey, since I didn’t want her to get her hopes up in case it took a while to find what we were looking for. In early October, we thought we might have found the perfect pet. It was a 3 year old, housebroken, Yorkie/Shih Tzu mix. As soon as we picked up Jacey from school, we headed over. We missed the dog by 15 minutes. I believe everything happens for a reason, but we sure were disappointed. Thankfully, Jacey still had no clue (we parked away from the shelter and Bryan went in by himself first). On the way home, we finally decided to let her in on our plan. She was so happy, she immediately started crying. After this, life went on as normal, only now Jacey was involved in the searching and every day she had about 5 more dogs to show me. On October 19th, the Nevada SPCA posted a picture of “Chica” who was debuting for adoption on their Facebook page, a few hours before they opened for the day. She seemed perfect! Yorkie female, 4 years old, spayed, house-trained and crate-trained. Remembering the previous experience, I threw myself into the shower, checked Jacey out of school and rushed to the shelter. We met her and as you can see, the rest is history. Jacey fell in love immediately and even I couldn’t deny how adorable she was, so we adopted her. Funniest part is, Bryan had no clue. He knew we were looking, but he was working that day and when he is out in the GCS flying, I can’t get a hold of him unless it is an emergency. I had sent him a text, so he saw it as soon as he started to head home. I am very thankful that my husband totally trusts my decisions in his absence or I might have been in the dog house :). Jacey promptly renamed her Zoey and it is hard to imagine life without her now. She is a riot, full of personality (attitude) and really good. She is dealing with some separation anxiety, she freaks out anytime we leave her sight but it is slowly getting better. We don’t know if it is just the fact that Yorkies are prone to that in general or if her being abandoned at the shelter caused it. She loves to be brushed, handles baths pretty well, did fabulous at the groomers but hates to have her teeth brushed and bows put in her hair (much to J’s dismay). She had a great vet checkup, with her only issue being minor seasonal allergies. She LOVES to go for walks and about jumps out of her skin when she sees you get the harness out. She rides fairly well, definitely better in the harness seat belt as opposed to the crate. She is a bit bipolar at the dog park, doing great one day and getting riled up at the sight of the same 2 dogs on other days. Work in progress. She is learning some basic commands and we plan to get her into obedience training in January after the holidays. She doesn’t bark much, except at the dog park, when our neighbor gets too close to our gate and she is in the backyard and oh…anytime I touch Bryan! She is SOOO jealous of him. We are working on that trigger, but it is so darn funny. I kiss him and she freaks out. I hug him and she freaks out. We aren’t quite sure what it is about him, but she sure is fond of him. She also gets super mad at him when she sees him put his flightsuit on to go to work and proceeds to pout. She will come curl up wherever I am and ignore him. Total diva, but we can’t say we weren’t warned. That was the first thing out of the shelter volunteers mouth when we requested to see her :). I was never a dog person until I met the dog that is now our dog. She looked at me, and something about her just made me say yes. It’s amazing what the right dog can do to change people’s minds, lol! I grew up with dogs, so I’m not sure where my aversion to them came from or when exactly it started?! Maybe it was the uber dumb wiener dog my Grandmother gave us as a wedding gift that we could NOT housebreak to save our lives! 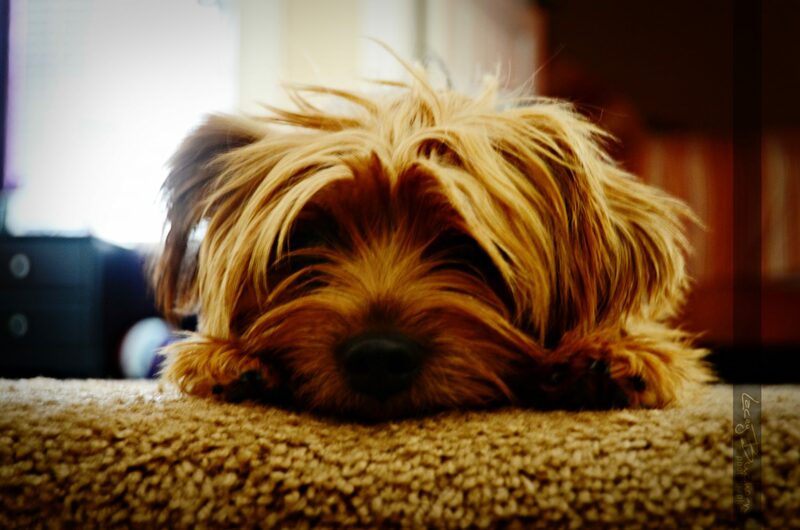 We love Zoey and it is a good thing, since Yorkies tend to have pretty long lives :).